Dark Witch Story: COMBAT is the Collectable Card Game/RPG bonus game that comes with Brave Dungeon’s Switch release. It’s a supplemental and not as balanced or deep as Brave Dungeon so it should be played after the main game, you’ll get the most out of it if you’re familiar with the regular Dark Witch enemies anyway. 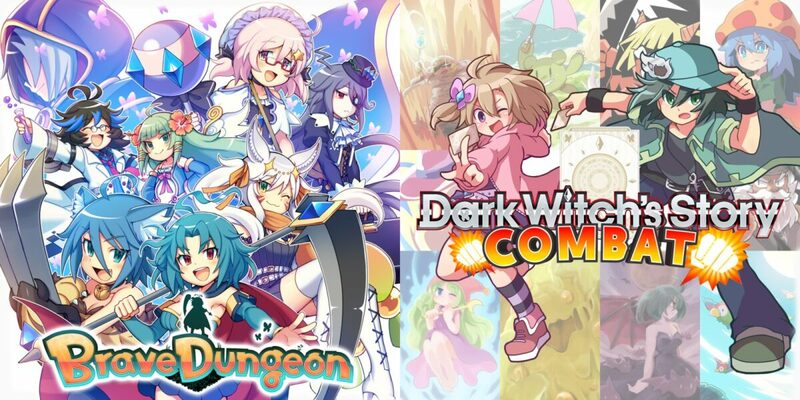 I didn’t see any other guides at all and Dark Witch Story can be a little confusing so I thought I’d make a guide for it as well, since I already covered Brave Dungeon and The Legend of Dark Witch 2. As always feel free to comment to ask questions, offer corrections, or just discuss the game. 2017-12-22: Card images added. Tidying up. 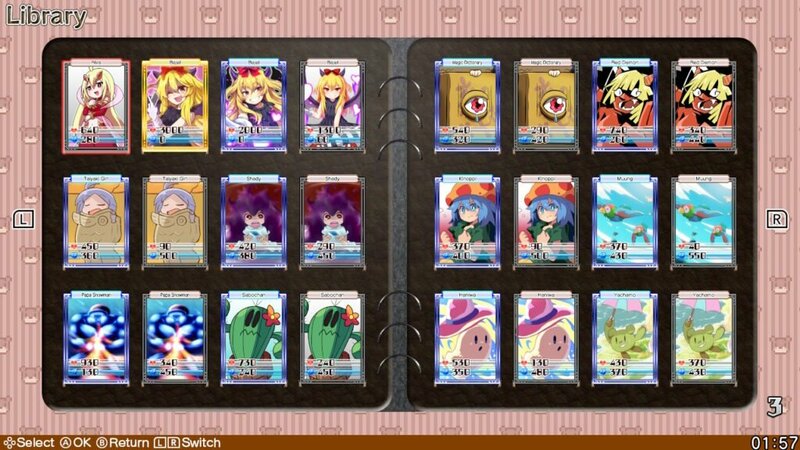 2017-12-21: Card Locations list is not totally complete, but contains at least the base card from every card set, so it can be used to 100% complete the game. 2017-12-20: Filling in Card Drops section. By Beginner Finals you’ll start to notice your beginning cards, despite being higher level, probably won’t be enough. You’ll want to edit your team a bit. Red Demon, Yachamo, and Moong are about the best cards you’ll have at this point, even at level 5 they should have a good shot at peating Beginner’s Final. Elements are literally Rock Paper Scissors, they don’t matter a great deal, but if your team is all Paper and you’re going against a boss round that is all Scissors you’re going to have an extra rough time. Syega Healing items will “overheal” your card, so their healing power is never wasted. Once you reach Expert you should grind for a bit to get at least 2, but ideally 3 Guardian cards. These cards will easily carry you through the rest of the game until the last section or two without much effort once hitting level 30 to start with. When completing a Story mode match your cards all receive Experience equal to the amount of Tres earned, divided by the number of cards. The only real ways to grind are to fight Story Mode matches, or to spend Tres (which is earned by said matches). You’ll also get a bonus of 3x Basic Tres when beating a Round for the first time (not exploitable for grinding) and a Victory Bonus of 2x the Basic Tres amount. The Basic Tres amount will be rewarded for a fight whether you win or lose, but it’s always preferable to win a slightly lower level round and get the victory bonus than to lose and get only the basic reward. Fighting the same match repeatedly will also drop Cards (press Y to see which cards each Round can award). Each round has 3 cards; you’ll win the first with a 100% chance the first time you with that Round, the other two are Rarer cards with much lower drop rates. This doesn’t necessarily mean they’ll be good cards; early rounds generally have multiple copies of lower level cards as their “Rare” drops.Card drop rate for Rare cards increases as you get duplicates of the common card. It’s generally best to find the highest level of the Story mode that your team can beat and repeatedly play it at x2 speed, using the Rematch option to replay quickly. Tres can be used to level cards exactly the same as Experience, so if you build up a good supply of Tres you can immediately bring up a new card to speed without extra grinding. Since winning is best 2 of 3, you can bring along a low level card along with 2 powerful cards if you’re sure the powerful cards will win, which helps you avoid dropping down to extremely low level opponents just to level a card. Every card has a few things: A Level, an Element, A Team Skill, and Stats. 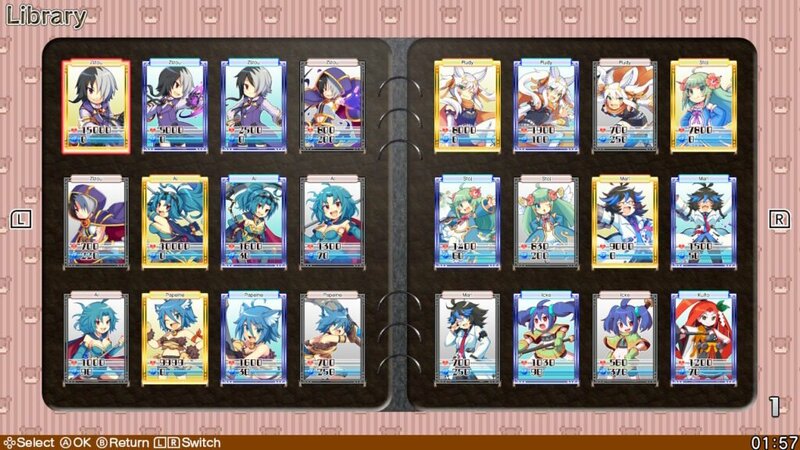 Base stats and Team Skill are inherent properties of the Character on the card, and Levels are gained with enough experience (or Tres; one XP is equal to one Tres). Some cards are objectively better than others, and as you play you’ll find some of your early cards may be worse than new ones despite a level gap. Syega is used to buy per-match Items which give a potentially critical advantage in battle. Items are used automatically as soon as the round starts or as soon as a heal is needed. Syega is not consumed; every time you play a match with three 100 Syega cards you’ll get 300 Syega to spend. Elements are Rock Paper Scissors (literally) and any Character card can come with any Element. Don’t sweat elements too much, but it’s good to have one of each represented in your main team if you can, since a team of Papers only will have a relatively hard time against a team of only Scissors. But a high enough level Rock can easily beat a weaker Paper card. There are three grades of cards: Monster, Guardian, and Hero. Most cards are Monster cards, which grow regularly and are most useful early on. They have no special attributes and can be evolved from Common to Rare grade to improve their basic stats. Guardian cards are rare and only accessible after the Expert Rank is unlocked. They grow with extremely high stats in both the Common and Rare ranks. They will be crucial early game. Hero cards are extra rare and only accessible beyond the Magician rank. They seem as weak as Monster cards until they’re evolved a total of four times, when they become Super Rare. At such point they become the strongest cards in the game. 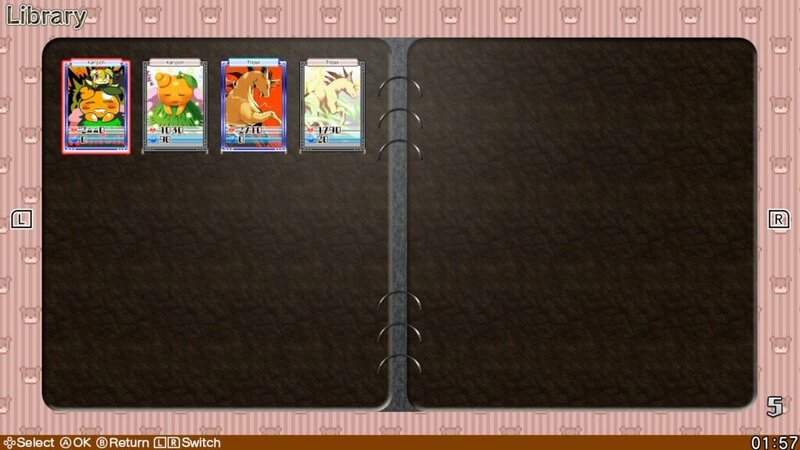 For reasons I cannot fathom, there is a limit of 60 cards per save file, and it is incredibly easy to hit that limit. Generally you should hold only one of a single Character’s card. Sticking to that rule will help you easily stay under the limit. Cards come in Common (C), Rare (R), and Super Rare (SR) qualities. Commons have a grey border, Rares are blue, and super Rare are gold. 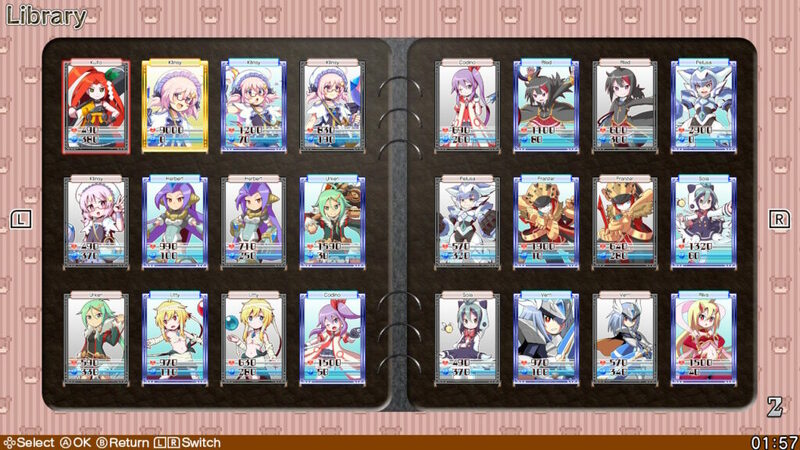 Card list is incomplete as I finish up Dark Witch Story COMBAT. 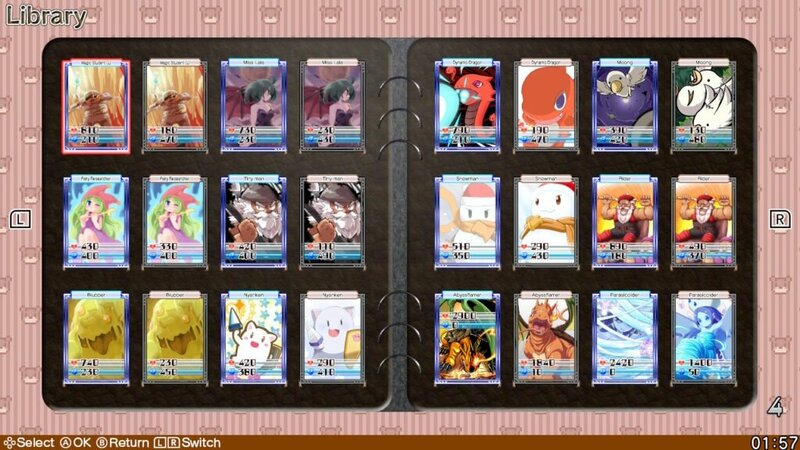 I think I have almost all cards, just not all rarities/stats. Every card has a set Hidden Skill that only activates when paired with another card of a different type that has the same Hidden Skill. For instance Kinoppi always has the Defense Up skill, but two Kinoppi won’t activate Defense Up. When paired with a Tayaki Girl card, which also has Defense Up, the skill will be activated however. If all three cards on your team have the same skill, its effects will increase. For example three +75 Syega cards will result in a +150 Syega effect instead. Each level of the Story Mode has 3 cards it can drop, one guaranteed to drop and two rarer cards. After you repeatedly play a match the chance of getting the rare cards increase and the drop rate of the most common one decreases. Note that many “rare” drops are just duplicates of the common ones, especially in the earlier ranks. It doesn’t seem to be worth farming to get the rare drops in anything below Advance rank. Guardian cards are marked in Bold and Hero cards in Bold Italics as they’re extra powerful cards. 1st: 60 Tres, Muung (C), ?, ? 2nd: 90 Tres, Kinoppi (C), ?, ? 3rd: 120 Tres, Red Demon (C), Red Demon (C), ? Final: 150 Tres, Haniwa (C), ?, ? 1st: 200 Tres, Moong (C), ?, ? 2nd: 240 Tres, Snowman (C), ?, ? 3rd: 280 Tres, Yachamo (C), ?, ? Final: 320 Tres, Shady (C), Shady (C), ? 1st: 400 Tres, Taiyaki Girl (C), ?, ? 2nd: 450 Tres, Blubber (C), ?, ? 3rd: 500 Tres, Shady (C), Taiyaki Girl (C), ? 1st: 700 Tres, Dynamo Dragon (C), Fairy Researcher (C), ? 2nd: 770 Tres, Nyanken (C), ?, ? 3rd: 840 Tres, Fairy Researcher (R), ?, ? Final: 910 Tres, Nyanken (R), ?, ? Game Master: 1,300 AbyssFlamer (C), ?, ? 2nd: 1,650 Tres, Sabochan (C), ?, ? 3rd: 1,800 Tres, Magic Student (C), ?, ? Final: 1,950 Tres, Al (C), ?, ? 1st: 2,500 Tres, Papa Snowman (C), ?, ? 2nd: 2,700 Tres, Codino (C), ?, ? 3rd: 2,900 Tres, Kuito (C), Blad (C), ? Final: 3,100 Tres, Blad (C), Litty (C), ? 1st: 3,500 Tres, Moong (R), ?, ? 2nd: 3,750 Tres, Stoj (C), Rudy (C), ? 3rd: 4,000 Tres, Icke (C), Papelne (C), ? 1st: 4,400 Tres, Magic Dictionary (C), ?, ? 2nd: 4,600 Tres, Miss Lala (C), ?, ? 3rd: 4,800 Tres, Sola (C), ?, ? Final: 5,000 Tres, Riva (C), ?, ? 1st: 5,200 Tres, Nyanken (R), ?, ? 2nd: 5,400 Tres, Tiny Man (C), Rider (R), ? 3rd: 5,600 Tres, Pelusa (C), Klinsy (C), ? Final: 5,800 Tres, Franzer (C), Pelusa (R), ? Majesty: 7,000 Tres, Klinsy (SR), Bajel (SR), ? Heals your card by 10% of its current HP. Most effective on high HP cards. Drains opponent by an amount to leave your HP equal to theirs. Useless if your HP is higher. Support my guides and articles on Patreon!